Hi there, I hope you had a lovely weekend! Part 3 of my Holiday Gift Guide is here! 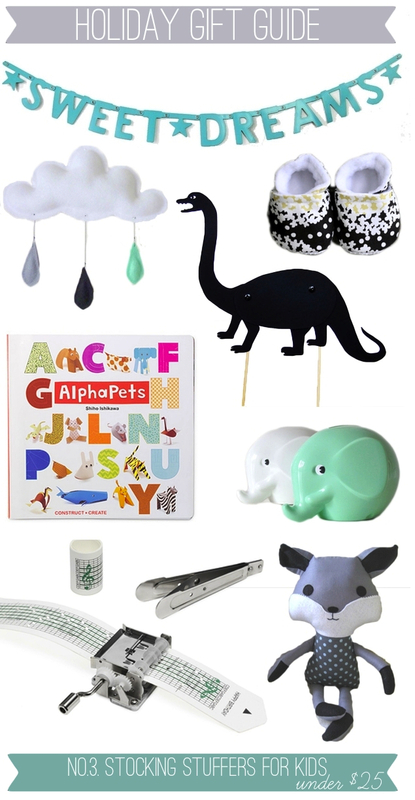 It's dedicated to stocking stuffers for kids, all under $25. Although I am already in my mid twenties, I have to admit that I would love to receive some of these gifts ;) I'm especially in love with the AlphaPets book. Without any scissors, glue, or origami experience, kids can create 26 origami animals corresponding to the 26 letters of our alphabet. There's a little stop-motion video here showing a few examples - very cute! On a side note, I'm guest posting on Bright, Bold and Beautiful today, as part of a "I am thankful for" series. You can have a look at it here. Have a beautiful day, and thanks for stopping by today! love the elephant coin banks.your blog is so cute. I'm loving those baby shoes and the old music reader - gorgeous little gifts. Love that little fox! And that sweet dreams banner would be so cute above a kid's bed, or on a crib.